This is a very nice hike with great views. Make sure you take enough water (we saw only one place where we could refill) and food and be prepared for a long climb (1500m from Lavertezzo to Pizzo d'Orgnana). Leaving Lavertezzo, you cross the pretty bridge Ponte dei Salti and follow the trail towards Brione. After some 15 min you'll see a sign for Pizzo d'Orgnana and at this point you take a left and follow what seems a neverending climb up the hill. Most of the way you go through the woods with occasional views of Valle Verzasca. Some 2.5h and 800m higher you get out of the woods and keep climbing up a beautiful valley with a few abandoned rusticos and a very pretty alpine pond, Btta. di Orgnana. Just above the little lake you get to Pizzo di Corbella, the highest point of this hike (you're over 1500m higher than Lavertezzo). The views from here until the end of the hike are absolutely breathtaking -- you get a simultaneous view of Valle Verzasca and Valle Maggia as you follow the ridge towards Madone. At this point you go down around 350m and you have a choice to keep climbing down to Mergoscia. 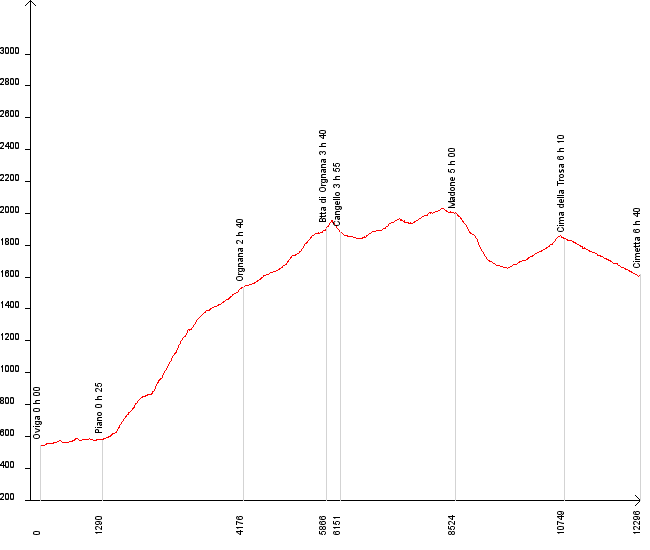 In our case, we take another climb towards Cima della Trosa and our destination, Cimetta. At one point of the approach to Cimetta (once you can see the buildings and the tower) as it's easy to get off the trail so make sure you check for the markings. From Cimetta you can either walk down to Cardada (a short descent of 340m) or you can take a lift (CHF 8 per person). The lift down to Orselina costs CHF 20 per person and from there you can take a bus or a train down to the center of Locarno for CHF 4.50.